Description: Selina's masterpiece mecha chassis. This model walks on four legs. May synergize with certain weapons. 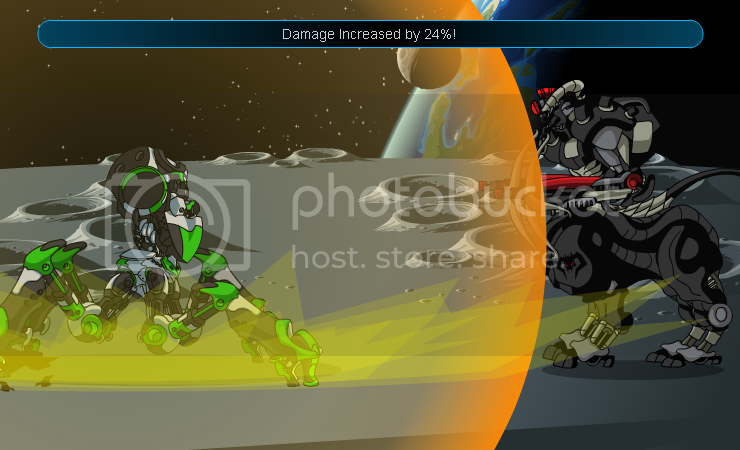 Damage Increased by X% where X = 1-50. Quad Body + Scanner Blade + Clusters = "Impervious" +50% Defense to player. Quad Body + Scanner Blade + Disruptor = "Ultra Strength Activated" +35% Boost to player. Quad Body + Scanner Blade + Dual Strike = "Super Regeneration Activated" Regenerates x HP each turn. Quad Body + Scanner Blade + Rail Blaster = "Ultra Vision" +35% Bonus to player. Quad Body + Scanner Blade + Rockets = "Super Regeneration Activated" Regenerates x HP each turn. Quad Body + Scanner Pulse + Clusters = "Strategic Advantage" -50% Defense to opponent. Quad Body + Scanner Pulse + Disruptor = "Critical Weakness Found" -35% Boost to opponent. Quad Body + Scanner Pulse + Dual Strike = "6th Sense" +35% Crit Chance to player. Quad Body + Scanner Pulse + Rail Blaster = "Blindness" -35% Bonus to opponent. Quad Body + Scanner Pulse + Rockets = "6th Sense" +35% Crit Chance to player.